MTN introduce unlimited free night browsing to it customers to stream, download unlimitedly on their phones and pc all you needed to do is to follow this simple procedures to get it working on your phone and PC. 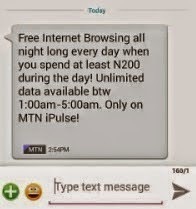 The message shows that it is necessary to be on iPulse before you can enjoy this MTN night free browsing. Note that you must use up to N200 during the day before you can enjoy this unlimited night browsing/download between 1am – 5am.